This is a novel about that most intriguing of questions: do you believe? Edward Bunyan believes. He is a professional believer. Believing has been good to him. He can read thoughts, predict the future and levitate. Bunyan’s colleague, Marmaduke also believes but he has doubts. A funny and disturbing contemporary novel. Keith Colquhoun is a writer of Scottish descent. Several of his novels have had exotic locations, Hong Kong, Russia and Morocco. Beyond Reason, his tenth novel, is set nearer home, in Britain and France. Colquhoun and his family live in Colchester. The phrase "can't put it down" is often bandied about, but I use it here without reservation because it is literally true. Beyond Reason is well written, fast-paced, entertaining and like Keith Colquhoun's previous works endearingly eccentric.If you are interested in a good novel that doesn't read just like any other novel, and with some thoughtful chatter about the state of religion, you'll like Beyond Reason. This book follows two people caught up in the confusions of modern-day faith. However, while following their struggle (particularly Marmaduke's), the book does not try to pin you, the reader, against the wall and make you ask what, if anything, is really 'upstairs'? I believe that is one of its strongest qualities. 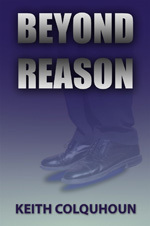 Beyond Reason could also have been a book where bias views are portrayed, and was arrogant enough to try and sway you. But it doesn't. It allows you to struggle with faith along side the characters, allows you to stand back and watch or, if you so wish, to aid a bit of good old soul searching. A fabulous read. Thought-provoking and weirdly funny. I grew to rather like the plodding Marmaduke and the antics of Bunyan are wonderful, particularly the menege a trois. The characters inhabit a strange world which is utterly believable if inexplicable.